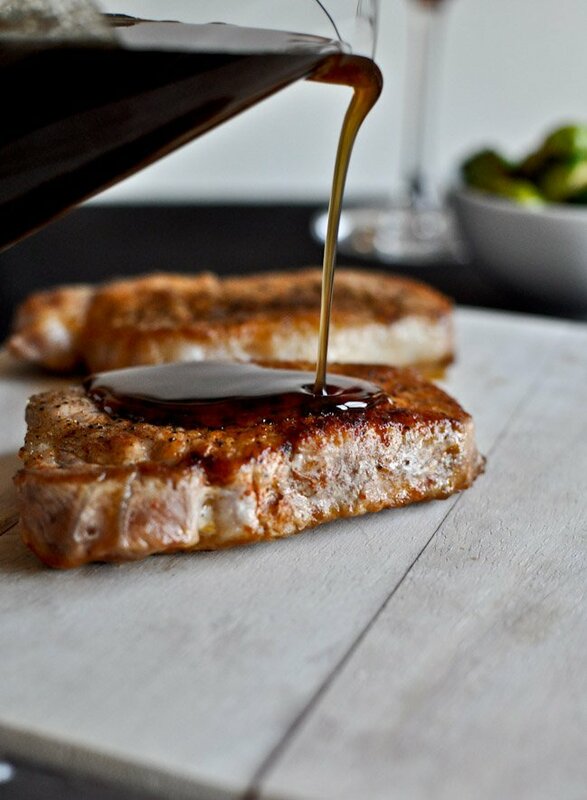 Maple Bourbon Glazed Pork Chops. Noooooo… not in the training bra and unmentionable categories you’re thinking of. I’m unfortunately average and quite boring. Snooze. But you know, like… other things. Vegetables? Still haven’t really bloomed. Making my bed? Uhhh nope. Putting fuel in my gas tank in a timely manner? No again. Cleaning up after myself? Unbloomable. Ever fully reaching adult status? Um. I don’t even know what that means. ????? So I can sort of relate to pork chops. After all, their full talents and capabilities are usually overlooked and not realized until much, much later… especially once everyone becomes sick of boring old chicken. 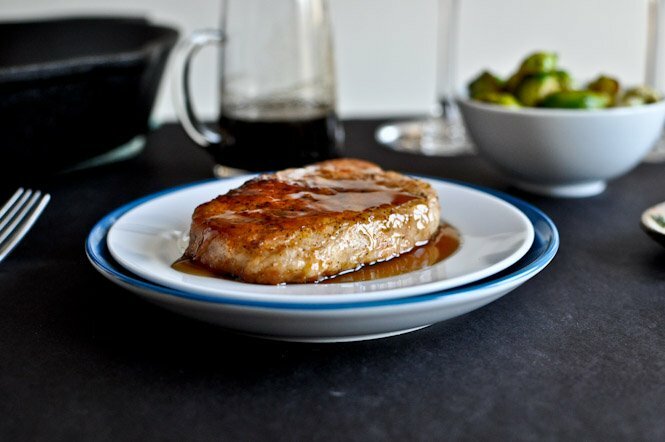 Pork chops are super tardy to the meal planning party and when they finally do make an appearance, it tends to be one so dry that even the best wine can’t help choke that bite down. Me too. More times than I can count. I once talked to my pork chops and yeah… that was weird but totally necessary. Pork is like my BFF now. Enter GLAZED pork chops. I almost always bread them, as any chance of dried out chews can be somewhat masked by butter, crunchy breadcrumbs and salty cheese. But in an effort to change it up and in the spirit of trying something new, I drenched them in a glaze that I usually reserve for salmon and chicken. Pork is so deserving though! I mean, I don’t know why I never thought of combining pig and booze before. It’s like my new life mission. And boy… do I love life. 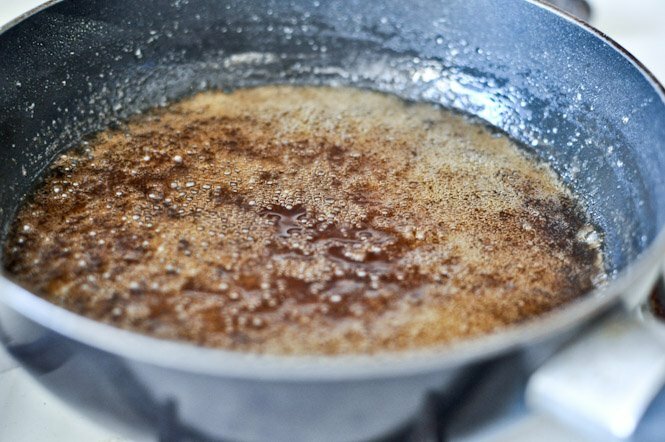 In a small saucepan, combine bourbon, sugar, maple syrup, garlic, worcestershire, vinegar and mustard. Bring to a boil, stirring constantly, then reduce to a simmer and let cook for 10-12 minutes, stirring every now and then. Remove from heat and let sit to thicken. P.S. 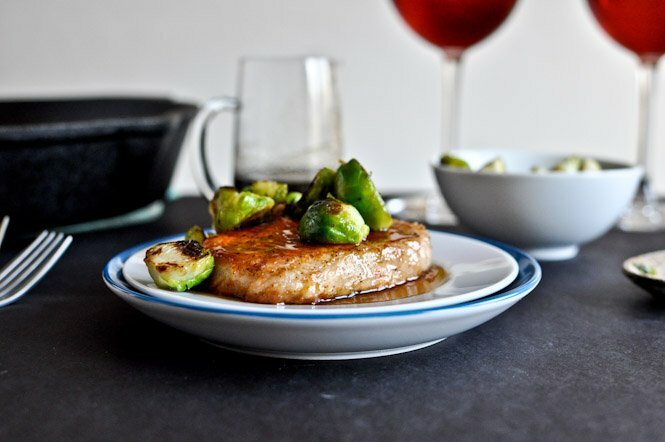 brussels sprouts in an accidental maple bourbon glaze are pretty good too. Especially with a hot fudge bourbon milkshake. Bourbon for everyone! You’re pork chops look absolutely delicious! My mom makes really good pork chops, but when I try to cook them… It just ends with a sad story. I’m going to try this one out, hopefully my luck with chops will turn around! oh. my. word. YES PLEASE! That glaze looks in.sane.! I love pork chops and I made that crispy bourbon glazed salmon and it was SO good! So this must be too :) Though I reeally love salmon! I had to laugh because I also let my gas tank go as low as it possibly can, like sometimes when I don’t even feel like I can make it to a station!! For no good reason.. but hating filling the gas tank and spending my money on something boring ..and I’m in my mid-20’s. Totally ridiculous! Gosh, every single time I let the light come on in my car for gas. Then I spend the rest of my day driving around worried I’m going to run out of gas. It’s so dumb, but I never thought about changing it. I guess I could be an adult and fill up my tank when I have 1/4 left instead of 1/50 left. But nah. No thanks. I love pork chops, but always forget to make them. I have never head glazed chops! adding to my list for next week! I’m a late bloomer too. Funny thing is……I spent 3 1/2 years as a vegetarian, who didn’t like vegetables much (and couldn’t eat soy or legumes) :/ What a good idea that turned out to be. And the car? I swear. Runs on fumes far more often than it should. Thank God for that distance thingy on the dashboard that tells me how many kilometres I have left before I’m stranded on the side of the road and calling for help! I can’t wait to try this! 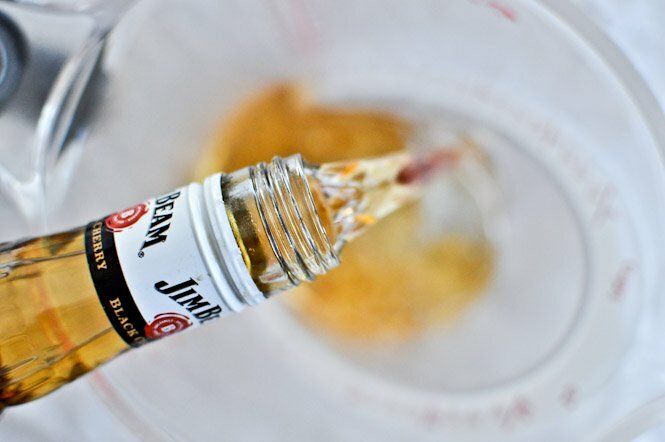 I don’t drink…..unless I’m drowning food in some kind of alcohol and this sounds amazing! Oh yes, yes, yes… these babies look good! Love the glaze! Ok…so this recipe looks delicious. I have made something similar (sans bourbon-note to self-add some whiskey), but I add toasted chopped pecans on the top after the maple sauce. You should definitely do it. Uh-maze-ing. Thanks for the delicious recipe, it will be making another appearance in our kitchen very soon! 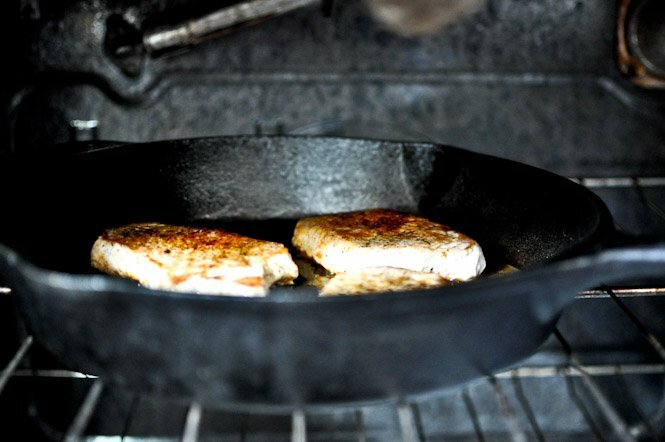 I don’t have an iron proof skillet, could you sear the pork chops on a skillet and then throw them and the broth into a baking pan? I made this last night and it was soooo good. I loved the glaze, so much that I could have eaten it with a spoon. I paired them with some fresh braised brussel sprouts which turned out awesome as well. First time I have ever had brussel sprouts, should have tried them a long time ago. Thanks again for the recipe! These were great. My entire family devoured them! That sauce would be amazing on pretty much anything I tell ya. Okay, made this tonight to rave reviews from everyone in my family, even my 8 year old!!! He ate a whole pork chop! Thanks so much:)!!! What brand of cherry bourbon did you use. 2/14/12 I made these tonight with parmesean crusted asparagus, and hassleback potatoes for our Valentines feast. We agreed that these were the best pork chops we ever had! Thanks bunches. Beautiful pictures, excellent post, keep up the great work!!! This was fabulous made it last night and my husband loved it. I had stuffing and salad with it. Not a bourbon fan, sorry!!! But what about rum? Appleton’s, or Kraken or Bacardi spiced rum? Hmmmmmm, duly noted and will let you know! That is, if there will be enough rum left for cooking…we loves our rum! Made this for dinner. Delish!!! I made the glazed pork chops tonight and they were delicious! I wouldn’t bake them next time, at least not that long, it made them chewy. Ok so these look absolutely delish….now here comes a really dumb question!! Can I eat these if I’m prego? I know that when you cook liquor it isn’t the same as regular liquor so can I make them??!!!! hahah so funny – I was just having a twitter conversation about this. I honestly have no idea, I’ve never been pregnant, but yes, cooking alcohol usually means most/all of it cooks off. If it was me, I would eat it. I think it is such a minuscule amount. Then again, I also come from the generation where my mom drank and smoke through all of her pregnancies… soo… maybe ask your doc? 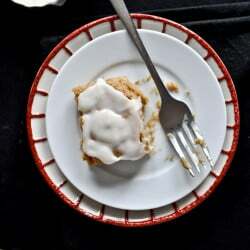 So, this is my first time on your site and while your recipes are amazing, I’m loving reading your posts. You have like the best personality. Totally funny, my sense of humor and just loving it and the recipes. Thanks for such a fun, entertaining site. P.S. Pork chops are late bloomers. I love them and this recipe looks amazing. You should at least give credit to the Big Green Egg website if you’re going to completely copy/paste a recipe from their website. Just a thought. i posted mine in early 2012. they posted it in later 2013. i would never steal someone’s recipe. i’d suggest you check the dates before you make such accusations. The date something is posted on the internet has nothing to do with it’s origin or source. These recipes are absolutely identical. If BGE in fact copied your recipe and published it, then I am truly sorry for the accusation. That nifty whipped cream dispenser your brother got you is not $160. Amazon has a pint version for $18.00!!!! Now everyone can own one. Looks like ISI brought their down $$ in half too. Was excited to make this old recipe tonight. My sauce turned it super bourbon-y and did not thicken whatsoever. Big disappointment. I made these last night and they were awesome! Because we had a 60 degree day in Boston I was able to char them up on the grill first and finish them in my cast iron skillet. I decided to pour half of that magical sauce (I made double) over the chops while they were in the skillet, which turned out great as the sauce really started to caramelize as soon as it hit the iron. Thanks for the recipe!